Wellington: Anil Kumble, the former India captain and one of the most versatile wrist-spinners to ever play the game, and Betty Wilson, one of the greatest women’s cricketers of all-time, will be inducted into the ICC Cricket Hall of Fame during the ICC Cricket World Cup 2015 match between India and South Africa at the MCG on 22 February, the International Cricket Council (ICC) announced today. Kumble, with 619 Test wickets, is the third highest wicket-taker in Test cricket after Muttiah Muralidaran (800) and Shane Warne (708), while his 337 wickets in ODIs ranks him in ninth position on the all-time list of most successful bowlers in that format. Kumble captained India in 14 Tests between 2007 and 2008, winning three and losing five. In the 138-year history of Test cricket during which 2,156 Tests have been played to date, Kumble is one of only two bowlers after England’s Jim Laker to have taken all 10 wickets in an innings. He achieved this feat against traditional rival Pakistan in New Delhi in February 1999. 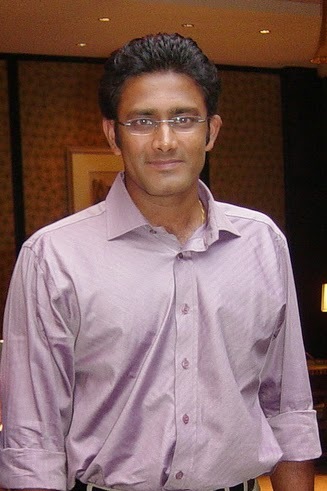 Kumble made his Test debut in 1990 in Manchester and his final appearance was in New Delhi in October-November 2008. During his career, Kumble played 132 Tests and 271 One-Day Internationals. Apart from his 619 Test and 337 ODI wickets, Kumble also scored 2,506 runs in Tests and 938 runs in ODIs. Betty Wilson, a former Australia batter, played 11 Tests between 1947 and 1958 in which she scored 862 runs at average of 57.4 and took 68 wickets at 11.8 per wicket. On her debut against New Zealand at the age of 26 in 1948, she scored 90 and took four for 37 and six for 28. In her second Test, she scored 111 against England, becoming the first Australia woman to score a Test century against England, and took nine more wickets. Against England in 1957-58, she became the first cricketer, male or female, to score a century and take 10 wickets in a Test. Wilson passed away on 22 January 2010, aged 88. Kumble and Wilson will be formally inducted into the ICC Cricket Hall of Fame during the innings break in the India versus South Africa match at the Melbourne Cricket Ground on Sunday 22 February. ICC Director and Chairman of Cricket Australia, Mr Wally Edwards, will present Kumble with his commemorative cap, while Wilson’s commemorative cap will be received by her nephew, Ken Wilson, from ICC Chief Executive David Richardson. Beforehand on Saturday, 21 February at 1100 at the Yarra Room, Melbourne Cricket Ground, Kumble will attend a media conference and will take questions about his career. Kumble, who is now the Chairman of the ICC Cricket Committee, is the fourth India cricketer to be inducted into the ICC Cricket Hall of Fame after fellow former captains Bishen Bedi, Kapil Dev and Sunil Gavaskar were inducted into the ICC Cricket Hall of Fame in 2009. Overall, Kumble and Wilson are the 77th and 78th inductees while two more former icons of the game will be inducted into the ICC Cricket Hall of Fame during the ICC Cricket World Cup 2015, details of which will be announced in due course. The process for the selection of players into the ICC Cricket Hall of Fame started last year when the ICC Chairman invited all the living ICC Cricket Hall of Famers to send their nominations. The ICC Nominations Committee reduced the long-list to 10 men’s and three women’s cricketers. The short-list was then sent to the Voting Academy, which included representatives of all the 10 Full Members, media representatives from all the 10 Full Members, Associate & Affiliate Member, women’s cricket and FICA representatives as well as living ICC Hall of Famers. The ICC collated the nominations and forwarded the ballot papers to the auditors who provided the final results.